That question started three years of planning, three years of saving most pennies, three years of pooling resources. I bought a new camera for this trip, and it was a partial motivator for finding a new day job (which was overdue for other reasons). The first mention of Bolivia in my e-mail was in February 2013. The trip accidentally became a major life milestone. We finally made it a reality. These are the first (of so, so many) photos to come from the trip. And the photos are from… not Bolivia. In fact, during the “Bolivia trip” I spent more time in Peru. The main scenic attraction of the trip was in Bolivia, and we’ll get to that in due time, but there were logistic reasons why spending more time in Peru made sense. I wanted to go to Machu Picchu and Jake did not. Also, the only rental car company stupid enough to let us go on a 5000 mile, four country, two plus week road trip on some of the worst roads in the continent was located in La Paz. Jake would pick up the car there, then meet me in Cusco, then we’d start our adventure together. For now, though, I was solo. The solo interval of the trip started as so many trips to this continent do, in Lima, and that’s where this series of photos will begin. Before the photos start, some notes. My trip report from the Pacific Northwest turned out to be more popular than my previous method of posting photos: piecemeal to Flickr/500px. I like to write, and this template allows me to tell stories around my photos and display them in a more fluid fashion. As a part of this process, I’ve elected to lower the quality bar I’ve used in the past to consider a photo “postable.” The best of the best will still be there, but there will be more “filler,” in that there will be more words and photos between the absolute highlights. This post has 19 photos, and if I were to use the method used on previous trips, I’d have posted two or three. My ultimate goal is to take the reader along the journey with me. Sometimes it rains on the journey, sometimes it’s overcast, and sometimes it takes place behind a windshield with spots on it. Most posts won’t have this many expository words, either. Not everything will be as profound as my first stab at this medium, but I think it’s worth continuing regardless. 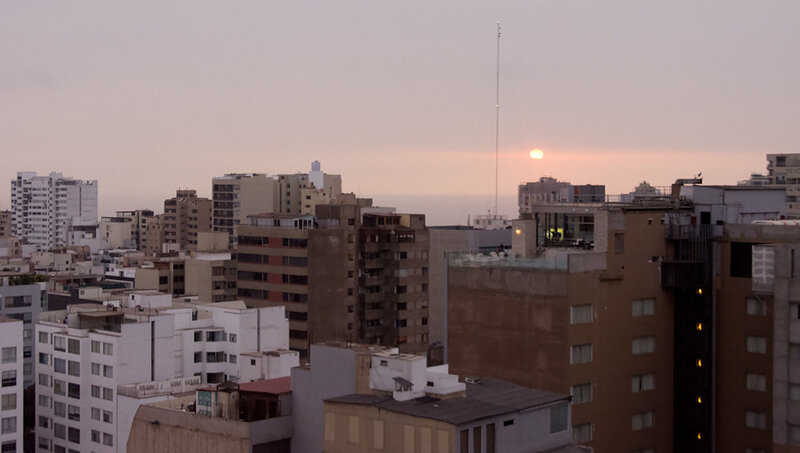 After a full day of travel, I arrived in Lima very late in the evening. I stayed awake long enough to have the mandatory arrival Pisco Sour, but then I had to rest up for the long day ahead. I only had one full day in Lima, so I had to make it count. Unfortunately the marine layer which Lima is so famous for was present throughout that one day. Sometimes you have to take the good with the bad. 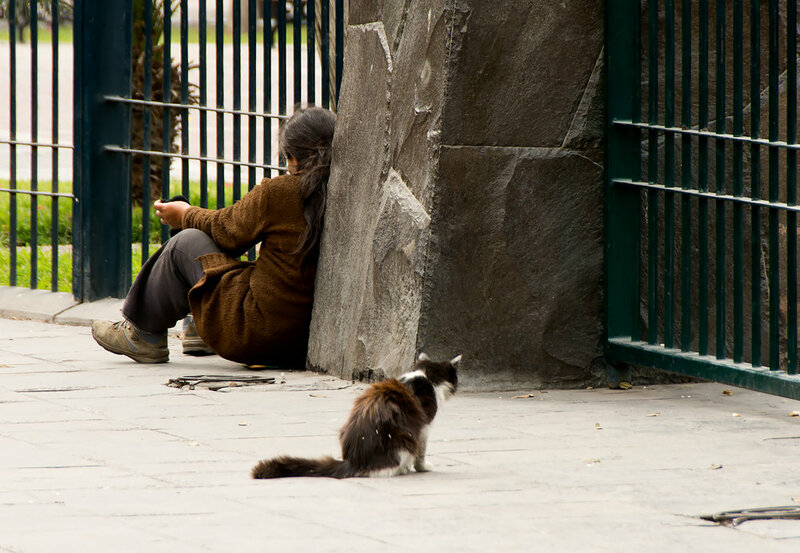 This is Parque Central de Miraflores, and it is home to dozens of cats. It’s odd because most of Latin America is full of stray dogs, which generally congregate en masse like this. A place full of cats seems a lot more rare. In Lima away from this park, I saw three other stray cats. During the rest of the trip, the dogs we saw outnumbered the cats we saw by roughly a 100:1 ratio. Weird! This park is a well-known landmark in the city, and most cab drivers didn’t know where my hotel was. 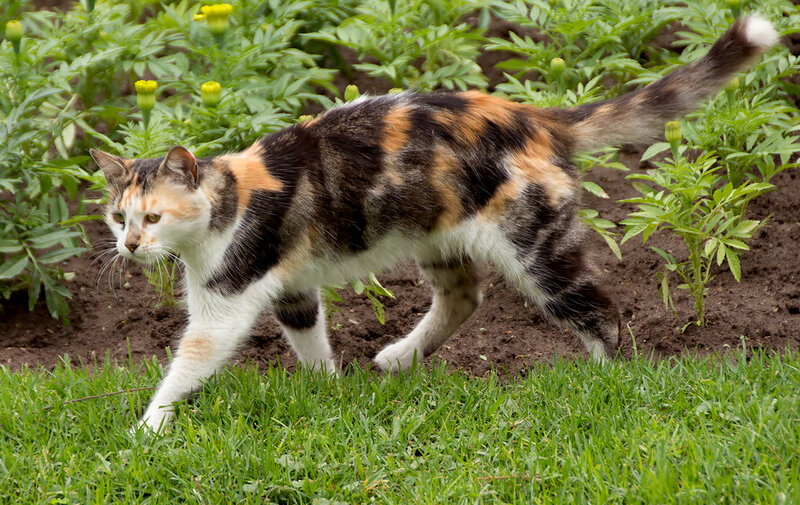 It became easier to point them to the park and just walk the two extra blocks, after stopping to say hello to the cats of course. 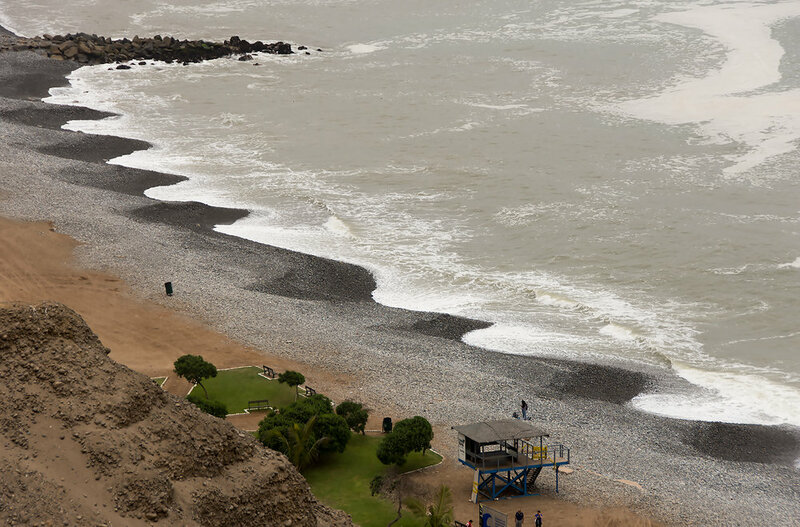 The Miraflores area is most famous for its beachfront. A friend of mine who traveled to Lima last year told me “it’s like Orange County [California].” Unfortunately this is somewhat true of the social aspects of Miraflores, but mostly he was referring to the cliff-side scenery. 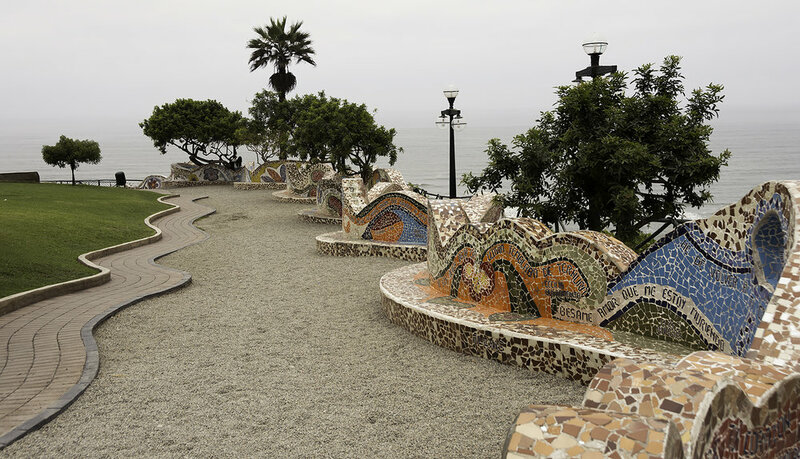 In Lima, these cliffs were highlighted with some very nicely-designed (if small) parks. I’d like to think that the patterns of the benches above are designed to match the patterns that the water makes on the beach below, but I can’t say for sure. 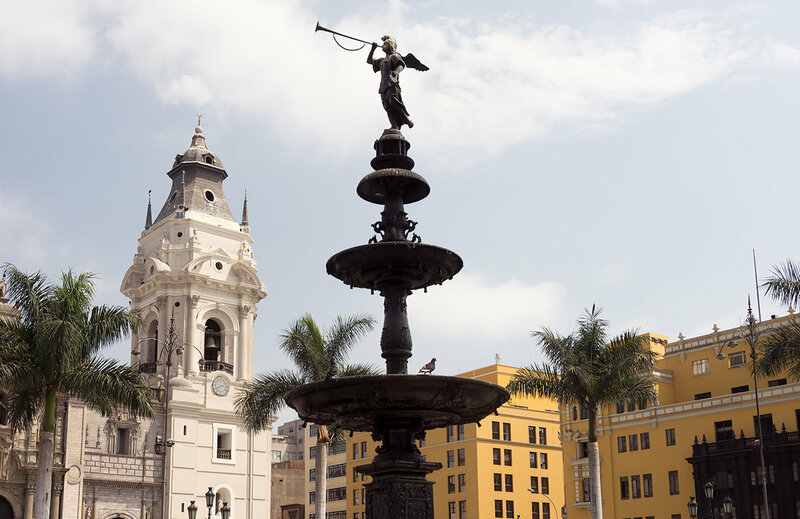 After some rest at the hotel, it was time to go downtown to see some of the “real” Lima. I was excited for most of the 30 minute taxi ride, but that was tempered a bit by the driver constantly repeating things like “siempre cuidado, siempre mira” (always careful, always watch) and refrains about how dangerous this area was. For the most part, I ignored his warnings and still believe I was correct to. It was midday in a crowded tourist area. The biggest concerns, to me, were pick-pockets and scammers. I was able to avoid the problem areas and was even rewarded by the sun coming out for a few minutes. At the north side of the plaza is the Palacio de Gobierno (Government Palace). Photos of the building were pretty difficult to get because of the large number of high fences, but I’m particularly fond of this photo of the top. After leaving the Plaza, the marine layer returned. That didn’t stop a short walk, first to the northeast (looking for Parque del Murella, which was unfortunately closed) then to the south. After some more pisco sours, it was time to return to the hotel. Or, as the custom became, the cat park. The sun did make one last surprise appearance, between two banks of the marine layer while I was in my hotel room. It was so surprising that I didn’t have time to realize that my camera was accidentally on ISO 2200. Oops! And that is it for the Lima photos. After sunset I got some delicious ceviche, found a US-style beer bar, and called it a night. Overall, Lima isn’t my favorite place in the world, and one day later I felt like I got out of it what I wanted. I didn’t feel myself longing for more time in the city, but I certainly didn’t regret my day there either. If not for some uncooperative clouds, there would have been some really stellar photo opportunities. The next morning I was off to the airport to fly to Cusco, which will be the focus of the next part of the series.